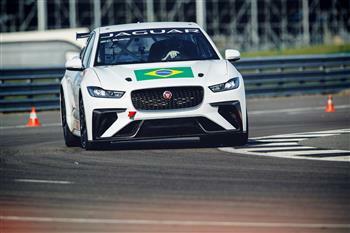 Silverstone, UK, 27 September 2018: Jaguar Racing have revealed a new wave of drivers who will take part in the inaugural Jaguar I-PACE eTROPHY, the world's first all-electric production-based race series. 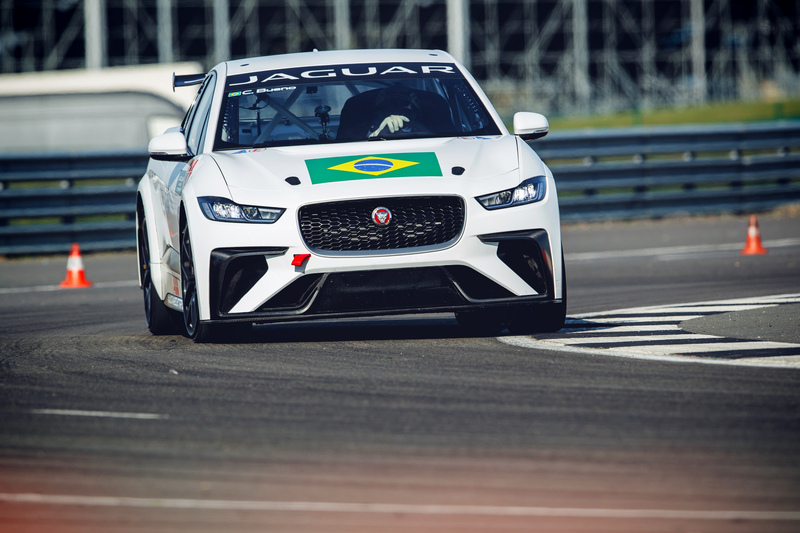 The initial teams to join the championship took delivery of their Jaguar I-PACE eTROPHY race cars at the first official acclimatisation test of the new support series to the ABB FIA Formula E Championship, held at Silverstone this week. Cacá Bueno, five-time winner of Stock Car Brasil, and fellow Stock Car Brasil driver Sérgio Jiminez joined the grid representing Jaguar Brazil Racing. The two-car team is co-sponsored by ZEG Environmental, a São Paolo-based company which invests in disruptive technologies and renewable energy projects and iCarros, Brazil's largest online vehicle sales portal. Simon Evans, brother of Panasonic Jaguar Racing driver Mitch Evans, confirmed his participation, representing a multi-sponsor team from across the Asia Pacific region. Katherine Legge and Bryan Sellers, driving for the US Rahal Letterman Lanigan racing team, also took delivery of their eTROPHY cars and secured some valuable test kilometres. Further multi-car teams from China, the Middle East and Europe will announce details, including their drivers shortly. In addition, a team from Germany attended the acclimatisation test and are due to announce their team name and driver in the coming weeks. The acclimatisation test provided the first teams and drivers the opportunity to test the all-electric race cars' dynamic performance capabilities for the first time at the Silverstone Stowe circuit. Drivers met the eTROPHY engineers and technicians, enabling them to start developing race set-up and strategies ahead of the inaugural race in Ad Diriyah, Saudi Arabia in December. Marion Barnaby, Championship Manager, Jaguar I-PACE eTROPHY, said: "This week's test confirmed the Jaguar I-PACE eTROPHY is shaping up to offer exciting, close and really competitive racing. The standard of drivers is high and with five continents already represented on the grid it is going to be a truly international series. We're looking forward to unveiling more competitors and completing final testing before our debut in Ad Diriyah on 15 December." At the test, Cacá Bueno said: "I'm really happy to be here. The car is fun, it's different and we're learning all about it. Sergio and I have a lot of experience and have raced around the world together before. This is an important championship – it's the first time electric touring cars will race in a global championship." Sérgio Jiminez added: "We will make history with Jaguar and we're the first Brazilians to sign up so we're very proud. Street circuits are very tight but between Cacá and I we have 20 years in motorsport so we'll use that experience to win podiums." Simon Evans said: "My brother races in Formula E and I've been following it for a few years now; it's exciting, it's definitely the future so it's great to be involved. The car exceeded all my expectations, it was really nice to drive and the braking performance is really good. Having my brother there will be great too – we'll be supporting each other and he'll definitely be pushing me on." ABB was announced as Official Charging Partner for the Jaguar I-PACE eTROPHY and will provide compact fast chargers to each team. After becoming the first premium manufacturer to enter the ABB FIA Formula E Championship in 2016, Jaguar has now created the world's first production battery electric vehicle race series – the Jaguar I-PACE eTROPHY. The history-making championship is the official support race to the ABB FIA Formula E Championship, with up to 20 cars taking to the grid from season five onwards. The series supports the launch of the Jaguar I-PACE, Jaguar's first battery electric vehicle, and reinforces Jaguar Land Rover's future electrification strategy, commitment to electric street racing and 'Race to Innovate' mission. Championship partners include official tyre supplier Michelin, official charging partner ABB, technical partner Sabelt, and official clothing supplier One All Sports. Jaguar E-TROPHY Test, Cacá Bueno.